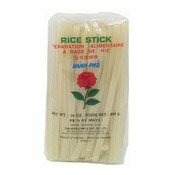 Pour rice stick into warm water, cook 6-8 minutes until rice sticks softens, drain. Rice stick is then ready for frying or cook as a soup. Ingredients: Rice Flour (90%), Water (10%). Simply enter your details below and we will send you an e-mail when “Rice Sticks 10mm (玫瑰牌沙河粉)” is back in stock!